CBR (Comic Book Resources) creates videos on all things Geek Culture. I work as a video editor for their long-form series “Debunk’d” which aims to explain why fan theories on superhero movies and anime don’t hold up to scrutiny. The videos I edited can be found in the playlist below. SourceGaming.info is a gaming website where I volunteer as a video editor, but I also animate, create video reviews, write opinion pieces and join discussions. My full list of work for the website can be seen here. Here’s an example, a review for the game “My Hero One’s Justice”. Nintendo Enthusiast is a Nintendo-focused gaming news website and one of many under the Enthusiast Gaming umbrella. I was a contributing writer, writing news articles, features and previews. My work can be found here. Denisse was looking for a design of Jane with a heroic vibe that would appeal to gamers. So I offered a design with a ’60s comic book aesthetic, Ben Day dots and all, and she loved it. The proceeds of the shirt were given to Donate Life America. 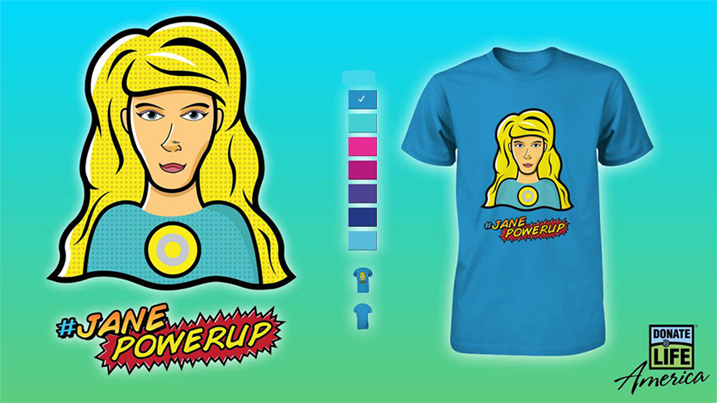 Jane, the character on the shirt, even bought one herself. This crew of four very different gamers talk about the latest Nintendo news each and every week. I moderate the show, record/edit, create topics, manage social media accounts, and created the art. Originally hosted by Eli, but I’ve taken the mantle since August 2015. The podcast is most prominent on Podomatic. The idea was simple, make a hybrid of two pokémon. After choosing to “fuse” one set of pokémon I wasn’t satisfied, so I made all 6 combinations. I ended up winning the competition for bragging rights. It starts with the original designs, followed by the features I added, and then the final fused forms.